This Q-Connect clipboard is a great solution for those who work on the go, providing a rigid and smooth surface that supports documents. A strong clip keeps documents fastened securely to the clipboard for clear, smooth writing, no matter where you are. 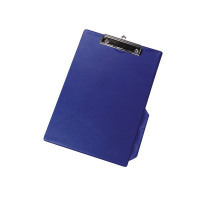 This clipboard is suitable for both A4 and foolscap documents and comes in blue.